The only way for your home to make a good first impression is for your entryway to make a statement. Your house can be the most beautiful in the neighborhood, but if the entryway is ho-hum, it’s doing your entire home—and you—an injustice. Here in Toronto, ON, there are many home entryway trends that have come and gone—but here are five that will elevate your home and stay relevant for years to come! Consider a bold or textured wallpaper on one wall in the entryway that fits your colour scheme. I know what you’re thinking: wallpaper? Yes, wallpaper! In fact, there are options that mimic stone, brick, and decorative tile that have been popular for a long while. Staying organized in the year 2018 is no simple feat. If your family is anything like mine, keeping to a schedule that everyone can see and participate in is a must. Make it cute and stylish: anything from a regular calendar to a corkboard with tacked notes to something more modern, like a colour-coded chalk wall with magnetized paint. Anything that reduces chaos! Dual-purpose furniture helps any size entryway. Add a wall-mounted cubby and storage bench—you can keep shoes, hats, snow boots, umbrellas, gloves, jackets, and school bags in the entryway without the clutter! Take pride in your family. Adding different sized framed photographs to a focus wall is a nice personal touch. Be creative. Not all the frames need to include a photograph; some can include quotes, paintings, your children’s art, and your family crest. Also, add a clock and mirrors for function and convenience. Does is appear welcoming? Seriously—do you love opening your current entry door every day? Is it worn out? Signs of wear and tear are: fading chipping, rotting, warping. Is it still operable? Meaning, does it still open and close, lock and unlock as easily as it did the day you bought it/moved in? Do you love the colour? If not, what hue do you wish to see each day? Does it fit the style of your home? Sometimes, homeowners make the mistake of choosing the cheapest entry door option… This usually means it has zero style and/or does not fit with the rest of the home’s design. 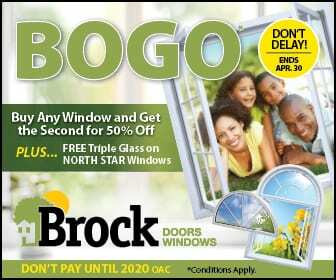 We here at Brock Doors and Windows know you want your home entry door in Toronto to make a good first impression. Further, we know you want to love your entryway! Come visit our showroom and see the countless entry door options we have for you!